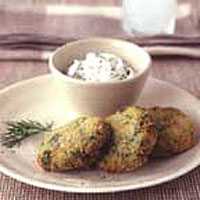 These crisp little patties are delicious eaten hot with a cool dipping sauce of yoghurt and dill. Grate the courgettes, sprinkle generously with salt and leave in a colander for 30 minutes. Meanwhile, preheat the oven to 190˚C, Gas Mark 5. Set aside 4 tbsp breadcrumbs. Spread the remaining breadcrumbs on a baking sheet and bake for 10 minutes, stirring a couple of times, until brown and crisp. Set aside to cool. Rinse the courgettes and press to remove as much liquid as possible. Spread on a clean tea towel and blot with another one so they are as dry as possible. Mix with the onions, eggs, the 4 tbsp untoasted breadcrumbs, the mint, parsley, nutmeg and seasoning. Form into 18 plump patties. Spread the toasted breadcrumbs on a plate. Coat the patties in crumbs, making sure they are well covered all over. Heat a frying pan over a medium-high heat. Add enough olive oil to come half way up the patties. Fry the patties until crisp and golden - about 3 minutes each side. Drain on kitchen paper. Beat the yoghurt until smooth, and stir in the dill. Serve immediately with the hot patties.